Found these in the health food shop a few weeks ago. A pack of two ready to eat vegan jelly pots. I feel like a kid again, I tried mine in a bowl with some Swedish Glace ice cream and some vegan sugar sprinkles on top. The jelly has a good natural colour, the texture is like jelly and the taste is very pleasant. Gelatine Free and sweetened with Fruit Juice, with no added sugar. Vegan and Vegetarian Suitable. Non dairy. Each 110gram pot is 100kcal. They come in little plastic pots with an easy peel foil lid. Perfect for a quick treat, ideal for lunchboxes. A great little dessert. 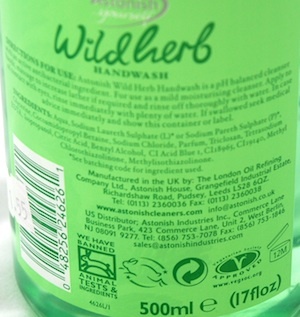 I have been using this veggie friendly hand wash for years. It comes in a number of smells including the Wild Herb as illustrated, Waterlily and Berry. There are some others but I have not tried them yet. 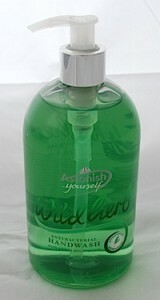 It is very kind to your skin because it is PH Balanced and comes with added moisturiser, also it is antibacterial. I have one of these in my kitchen and bathroom. The smells are very pleasant, the wild herb smells very clean and fresh, the berry smells like berries and the waterlily is quite flowery and light. What sur prised me is the price, for such a quality product a 500ml pump bottle full is only £1.55 each. I buy this from my local independent hardware store. I love the fact Astonish do not use animal testing, and is is BUAV approved and it is Vegetarian Society Approved. So no animal ingredients. It is also made in the UK. The bottle can be recycled.